Madalina Stoica trained at the Floria Capsali Choreographic High School, and upon her graduation, she joined the Croatian National Opera. In 2009, Madalina became a Soloist with the National Opera of Bucharest, where she performed leading roles in Don Quixote, The Nutcracker, Snow White, Giselle, The Sleeping Beauty, and Paquita. She joined Tulsa Ballet in 2012 and was promoted to Principal in 2016. 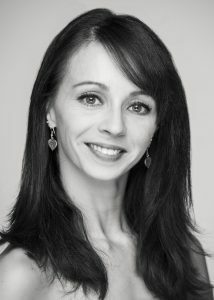 Since joining Tulsa Ballet, Madalina has performed leading roles such as Svetlana in Dracula (Stevenson), Kate in The Taming of the Shrew (Cranko), Juliet in Romeo and Juliet (Liang), and Tatiana in Onegin (Cranko). She originated the role of Dorothy in Edwaard Liang’s Dorothy and the Prince of Oz, which had its world premiere at Tulsa Ballet in 2017. Her contemporary repertoire includes Rooster (Bruce), A Million Kisses to my Skin (Dawson), Remansos (Duato), In the Middle Somewhat Elevated (Forsythe), Petite Mort (Kylián), Age of Innocence (Liang), Infra (McGregor), and Classical Symphony (Possokhov), to name a few. She has also been featured in original works by Luciano Cannito, Ma Cong, Jorma Elo, Nicolo Fonte, Young Soon Hue, Ashley Page, and Dwight Rhoden.